Matt’s Leaf is located at the Seattle Central Library. If you have photos or memories of Matt, please comment. Laura Ann Barringer was born Sept. 1, 1954 to Billie and Connie Barringer. She grew up in Lake Forest Park, WA, and graduated from Shorecrest High School. Growing up she loved horses, animals, and modeling. She was bright, kind, smart, and caring. She had a certain light about her and people were drawn to it. In 1981 she moved to Hawaii where her daughter Chantelle was born. Her son Jarrett was born in Washington in 1990. She devoted her life to her children. Laura became a grandma to Ayden, Kyler, and Kenzie; she loved them more than anything and was the greatest grandma anyone could ask for. She wanted to spend every moment with them and they cherished every second she was around. Laura would have done anything for anyone, even if it meant giving the shirt off her back or going without. That’s just how she was. At the time of her death, Laura had lived at McDermott Place for several years, after being homeless in Lake City. Laura’s Leaf is placed at Seattle Mennonite Church. If you have photos or memories to share, please post a comment. Christen Beaty, born November 23, 1973, was found dead near the intersection of 130th and Lake City Way on October 22nd, 2017. He died just a few weeks after being evicted from his apartment. His ex-mother-in-law, Debbie, remembers Christen as gentle, tender man. He was loved! 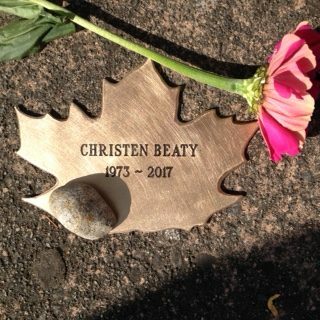 Christen’s Leaf is placed at the Mini Park in Lake City. If you have photos or memories of him that you’d like to share, please post a comment below. Terri’s Leaf is placed at Dutch Shisler Sobering Center (July 25, 2014). If you have photos or memories of Terri, please share them in a comment. Kathy Blair, a creative only child, spent most of her life in Akron, Ohio, living with her mother. While I do not have the skill to tell Kathy’s story as well as she could have, I want you to know that Kathryn Ann Blair had a beautiful face, thick, wavy hair, big brown eyes, lots of personality, many talents, and people who loved her. Hilary’s leaf is placed at the Family & Adult Service Center. If you have memories or pictures of Hilary, please post them in the comments. For more information on Trina, see the Seattle Times and KIRO 7 articles. Trina’s Leaf is at Angeline’s. If you have photos or memories of Trina, please post a comment. Bobbie Joe’s Leaf is placed by Ballard Commons Park. If you have photos or memories of Bobbie Joe, please leave a comment. Beloved Real Change vendor, former fisherman, found under Ballard Bridge. His wife was Karen Lee Pedersen, whose Leaf was originally at Real Change. Karen’s Leaf has been moved to Ballard next to Jeff’s. Jeff’s Leaf is at Ballard Commons. If you have photos or memories to share, please post a comment. Terry’s Leaf is located at Downtown Emergency Service Center. If you have photos or memories of Terry, please post a comment.